The benefits of a classical training are many. And combined with all the contemporary information out there on technical aspects like double taper laminations, vacuum veneering, loose tenon joinery and developing your own personal design aesthetic, the chances for a successful business model just increased 100%. I am a strong believer in being able to diversify, to be able to offer your skills on more than one platform. To be flexible in what you do and to still maintain the highest level of craftsmanship and aesthetic integrity. With that in mind, there is almost no reason a well prepared craftsman/shop should be short on work. Over the last several years I have been developing a visual aesthetic I call Frost and a dyed version I call Black Ice. While I have done several table tops using the black ice concept, I had been itching to follow through on some conceptual drawings from my sketch book on doing a Black Ice Cabinet. The following is a brief account of that realization. I have been captivated by the idea of a cabinet having a black exterior and a glowing golden interior. You know, the kind that sings like a chorus of angels when the doors open. Produced in 1880, coach #491 was made by the world famous Abbot and Downing Co. of Concord, NH. This coach was made originally for the Glens Falls and Lake George (NY) Stage Co.
Coach #491 was not your typical mail or hotel coach. Being the largest model, this vehicle had the capacity to haul 32 passengers—12 inside and 20 outside including the driver. The result was a mantle piece. Obviously this is more than just a mirror. In fact, it seems to be almost unique in its functionality. As a piece of furniture, its classification would be similar to a clock in that its function is a little more hands-off as far as interaction is concerned. But honestly, who ever heard of a mirror with drawers? I hadn’t. But now there is one and building it was a near monumental task. The concept of a mirror—to reflect the room. The glass creates a reflection of the room and the mantle piece itself is a reflection of the various pieces in the room as well. So far the library room, where this mantle piece resides, has eight pieces of my furniture in it. The elliptical shape is a design device I have used many times in my career. It is useful as a visually interesting departure from the more common round or semi-round (circular) form. I also find it a very functional alternative (Frost table) to the true demi-lune which is actually semi-circular. I have frequently contemplated the emotional beauty and impact that music can have on the listener. I have attempted to duplicate the same effect visually. Perhaps it’s an impossible task, but the attempt should still be made. Think of this piece in terms of music. It’s not just a simple tune or even complex melody. It’s rather more like a concerto with separate, yet unifying movements. Utilizing the broad reach of a collaborative made this idea easier to compose. The piece as presented can show two distinct, yet related personalities. Most often when major pieces are designed they are developed with a continuous, similar theme. Yes, frequently there are different aspects that we are presented such as with secretary-desks often showing an open, involved element, and a closed, secured element. The White Mountain Breakfront goes beyond this. This piece of furniture represents the most extensive, developed piece yet, personally and in the collaborative Lambovich series. 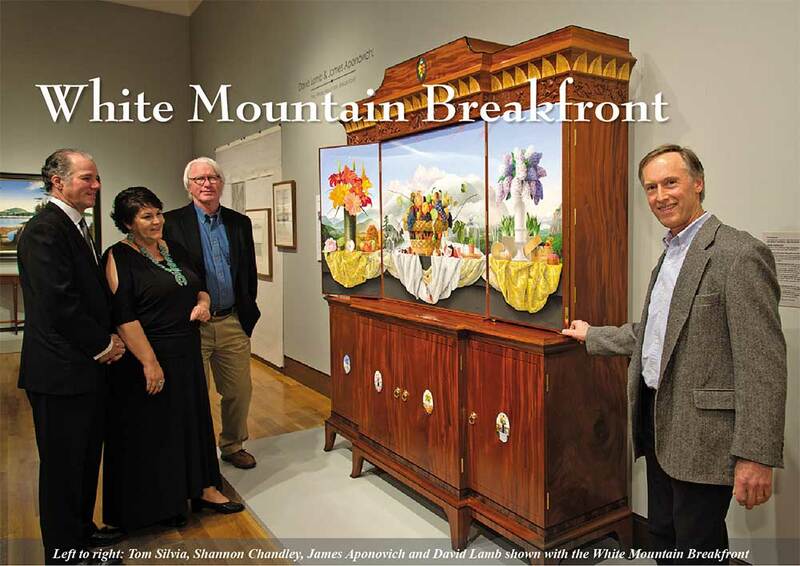 White Mountain Breakfront, also known as “Lambovich IV” was unveiled at the Currier Museum of Art on Nov. 1 and will be on view through January 6, 2013. The monumental cabinet combines the artistry (as well as the names) of David Lamb and James Aponovich. Together, Aponovich and Lamb represent the best of New Hampshire art and craftsmanship. I have become truly enamored by the vitality, complexity and the exotic nature of birch crotch figure. In my opinion it equals the formality of satinwood along with its delicacy and depth. It is truly our own native exotic. This wood was often used to great effect by our forbears of the 19th century in New England during the high point of the neoclassical period we call Federal. This sideboard represents many departures from a “period” piece of furniture. It does, indeed, represent that same traditional aesthetic yet introduces a number of new thought processes and techniques. It would be easy to take any one of these aspects and develop an article on each of these, yet to give an overview on the entire project as a general “aesthetic vision” makes the most sense. A true collaboration is an open exchange of ideas, in this case between an artist, our client, and myself. The collaboration of my work with artist James Aponovich has produced pieces we humorously refer to as Lambovich. The collaboration is more than just putting two disciplines together. There is a constant discussion of form, proportion, color and the integration of elements.